Fishermans Cave Bait & Tackle has been providing local fishermen with a selection of live bait and tackle. Our goal is to offer a variety of items needed to have a successful day of fishing. We are a licensed agent for Michigan and Ohio fishing and hunting licenses. Leaf worms - $3.50 for 25 ct.
Jumbo Panfish worms - $3.50 for 24 ct.
Baby Crawlers - $3.50 for 24 ct.
"Always helpful and the best shiners in town !!!!" - Jeff C.
We are located off Summit St. before the Ohio state line. Access to Halfway Creek DNR boat launch at the end of the road. 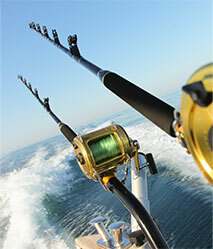 Pick up your tackle and accessories and launch your boat for a day of FISHING near Monroe, MI and Toledo, OH. I-75 southbound to Exit 2 Summit St.
We are located approx 1/4 mile on left side next to BiState Marine. Exit #209 Ottawa River Rd exit in Toledo. Left turn onto Suder Rd. Right turn onto Shoreland up to Summit St.
Left on Summit St. approx 1/2 mile. Located on right side next to BiState Marine. Michigan DNR Halfway Creek Boat Launch at end of the road.